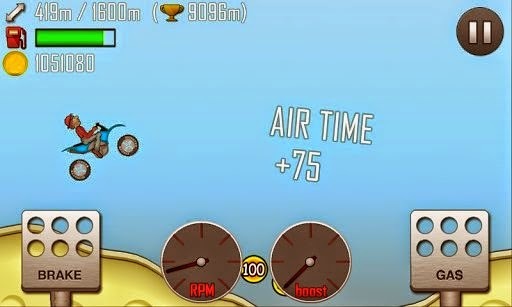 Hill Climb Racing Android game update with new vehicle Big Finger and feature distance to next gas. This game is unique and awesome for anyone who likes this kind of game. With the addition of vehicles, it is getting more addictive. Each vehicle has it is own tricks to control. Some players may prefer a vehicle than other. The game is simple but addictive. Even with it being simple, it still offers customization options that make the game more interesting every time you play it. Once you get the gas/brake rhythm down, it gets even better! This game is good for low end devices. The constant updates and drive to beat your old high scores keep you playing long after you unlock everything. One of the most addictive and entertaining physics based driving game ever made. Simple to play hard to master, it is so much fun you can unlock different stages and different cars.